Choice evolves in a context of opportunity, maturity, and experience. In crafting our relationship, in transforming our marriage into “art,” we can aspire to choose, over and over again, to be compassionate and loving grownups, capable of making compassionate and loving choices. Babies don’t do relationships very well, especially when it comes to making plans and deals, settling differences, coping with hurt, delay of gratification, and disappointment, and sustaining the perspective that “we both count all the time”. They are inexperienced, and lack the judgement and self-control to make good choices. Babies are great. Being childlike can be great. The child in our souls can be cute, and fun, and creative, and charming, but, “as wonderful as children can be to have on our trip, we don’t want them driving the bus.” (Somebody smart said that). A couple was camping in a beautiful mountain forest on their anniversary weekend. Evening was descending rapidly and they knew they had to hurry to get things put away before it got too dark to see. Suddenly, the husband saw a large shadow start to move at the periphery of their campsite. ”What’s that?” he asked nervously. “Oh my God! It’s a huge bear,” answered his wife, just as frightened. ”W..w..what should we do,” stuttered the husband. ”I’m going to run for it,” answered his wife, already running. ”You can’t outrun a bear,” shouted the husband after his wife. Maintaining a commitment to exist in our loving, compassionate “grownup” mode takes enormous intention and focus. It is so easy to be “triggered” and to find ourselves reacting to a word, deed, or circumstance, (real or imagined), and to immediately fall into our “baby” mode. Once there, we are adversaries instead of partners. Then, we are squared off and ready for battle; then, we will use every manipulative trick we have; then, the goal is to win… and we cease to care about what happens to the other guy. Often we can work our way out of it. Eventually, if at least one of us can remain, or become, a centered, loving, compassionate “grownup,” that person can bring the milk and cookies, and make things “all better”. But if we both get triggered and go to the “baby” place we will find ourselves in a sandbox fight, and nothing will be resolved until we regroup, find our way back to our compassionate, loving adult, and create a solution that derives from that compassion and love. 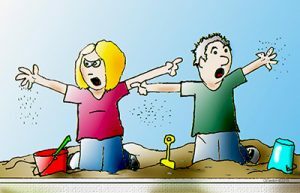 The more time we spend, and the more manipulative we become in our sandbox fights, the more our ensuing anger, hurt feelings, and resentment will accumulate, lowering reactive thresholds and contributing to the next triggering event. Most of the old religions of the world direct their members to pray 2 (Hindus), 3 (Jews), 5 (Muslims), or 7 (Christian Canonical) times per day. Buddhists meditate up to many hours per day. In secular terms, we might say that they have all figured out that without, discipline, reminders and intentionality, people gravitate back to, or are reflexively triggered into, our immature, un-evolved, habit-dominated “baby” place. When we focus (pray, meditate, remind ourselves, stay intentional…), we can often choose to inhabit a more evolved, loving, compassionate, even transcendent, state. In our default mode we are spinning on the hamster wheel of our lives, putting one foot in front of the other, repeating the dysfunctional, habitual patterns and forgetting the intentions and aspirations we have regarding who we want to be in relationship with our beloved partner. Remember, that a great relationship, or marriage, is not an entitlement or a birthright, and that WE have to keep growing if IT is to keep growing. 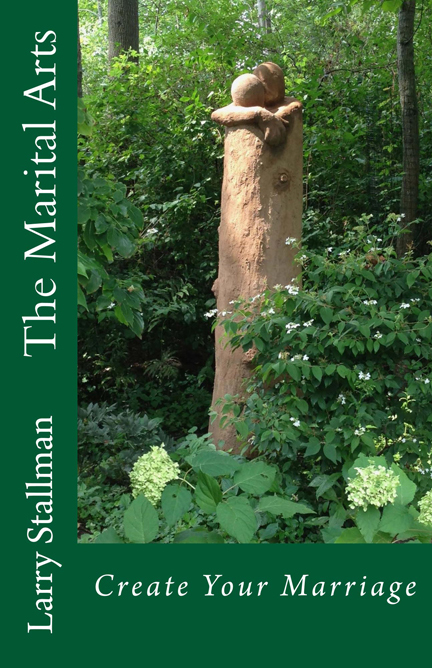 by Larry Stallman Click to purchase.